A versatile range of tiles in both glass and Acrylic. 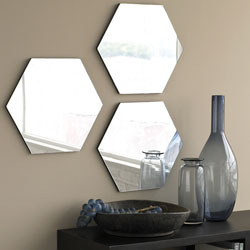 Mirror tiles offers the flexibility to create a really unique look to your bathroom or kitchen. With sizes ranging from a delicate 55mm square up to a statement piece 450mm square – your options are endless with our new mirror tile selection. Our range of diverse mirror tiles are the perfect way to spice up your bathroom, kitchen or garden. Available in both glass and acrylic, and ranging from a tiny 55mm tile up to a statement 450mm piece, our mirrored wall tiles cater for all preferences and styles. Create a look that is completely different with our circular mirror tiles; use them to create an interesting and attractive feature in your bathroom or scatter a selection of our square varieties around the walls for a really funky, contemporary touch. Our mirrored wall tiles are perfect for use in commercial settings such as offices, bars or clubs too; they create a stylish atmosphere and add an elegant and classy look to any wall or room. Please feel free to browse through our extensive collection of mirrored wall tiles and find the perfect mirror tiles for your interior settings today. Our range of diverse mirror tiles are the perfect way to spice up your bathroom, kitchen or garden. Available in both glass and acrylic, and ranging from a tiny 55mm tile up to a statement 450mm piece, our mirrored wall tiles cater for all preferences and styles. Create a look that is completely different with our circular mirror tiles; use them to create an interesting and attractive feature in your bathroom or scatter a selection of our square varieties around the walls for a really funky, contemporary touch. Our mirrored wall tiles are perfect for use in commercial settings such as offices, bars or clubs too; they create a stylish atmosphere and add an elegant and classy look to any wall or room. 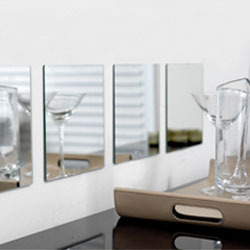 Please feel free to browse through our extensive collection of mirrored wall tiles and find the perfect mirror tiles for your interior settings today.